A few years ago I thought that the NHL had the best referees in professional sports. As of right now they’re right on par with the NBA and NFL. This call was absolutely disgusting and completely changed the momentum of the game. 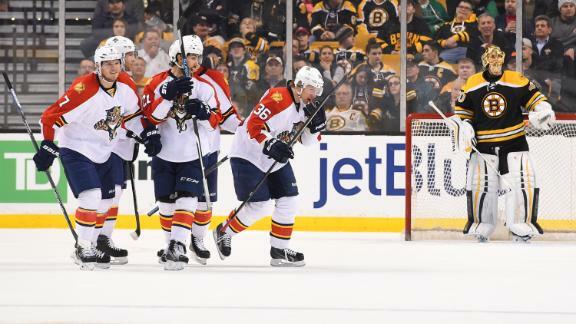 The Panthers went on to score two more goals in the third period to beat the Bruins 4-1. Bad reffing aside, the B’s have played some terrible hockey as of late. Thursday night’s loss was their fifth loss in a row, all five coming in regulation. To put things into perspective, that’s their worst streak since 2010. The lone highlight was Frank Vatrano scoring a goal in his first game after being called back up from Providence. This late-season slump is starting to become reminiscent of last year’s collapse. If they are to completely fall apart and miss the playoffs again, every Bruins fan will experience deja vu. Claude Julien will try to get his squad to right the ship Saturday night against the Maple Leafs in Toronto.